Greetings! We are once again in full Spring Swing. The fruits and vegetables are blooming and the harvest is making its way up the map. We are picking our very own strawberries. Neighboring farms are starting to pick some tree ripened early peaches. We are making weekly trips to the USDA Farmer’s Market in Asheville North Carolina where Todd and Tyler are hand selecting the produce for our farm stand. Come and select some of your own fresh produce to take home and share with your family! Have a safe and restful Memorial Weekend. 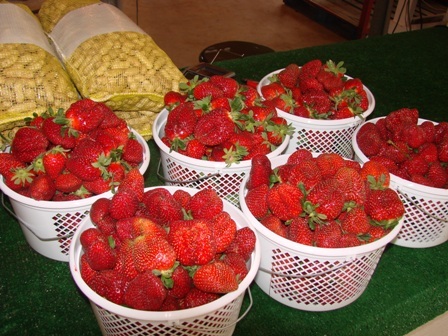 This entry was posted in Uncategorized and tagged Farm Produce, fresh strawberries. Bookmark the permalink.